Magical Stoner Holographic Acrylic Keychain 2.5"
Announcement Welcome to my shop! I provide cute cannabis related products! Most of my stickers have a holographic option! Check it out! Welcome to my shop! I provide cute cannabis related products! 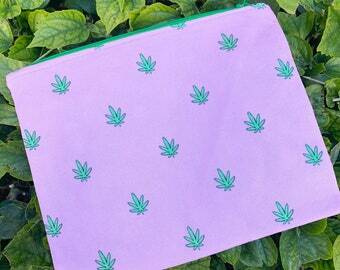 Cute Stash Pouch Weed Print 6.5x8"
Super cute! Love this sticker. I'm not a fan of bunnies but I fell in love with this! 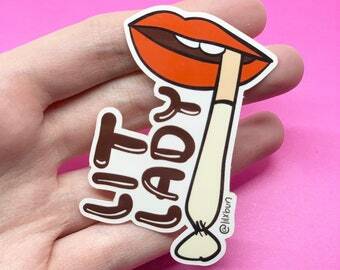 Super cute and super durable sticker! The pin came really fast and it’s so cute! The seller even threw in a cute sticker! Hey everyone and welcome to my shop!! My name is Kayleigh and i'm an Illustrator! Thank you so much for coming by my shop! Check out my Instagram for more fun designs and an insight to upcoming products! Hi i'm Kayleigh! :) I'm a 26 year old artist who is just entering the world of art and design. I love making cute stuff so I hope you enjoy! Printful is my tshirt manufacturer. Once you order, Printful fulfills the order and ships it directly to you. If you order from outside the US and have to pay Duty & Taxes upon receiving your order, I am not responsible for paying for these. This is upon the customer to pay. If you choose to use untracked shipping then please allow up to 2 weeks for USPS to deliver. If you’re international please allow 8 weeks. If you do not receive it by that time, please send me a message! If you receive a clothing order where the print looks off color/something is wonky, please send me an etsy message with a picture of what you're talking about. I will work my best to get a replacement sent out, but please message me first!